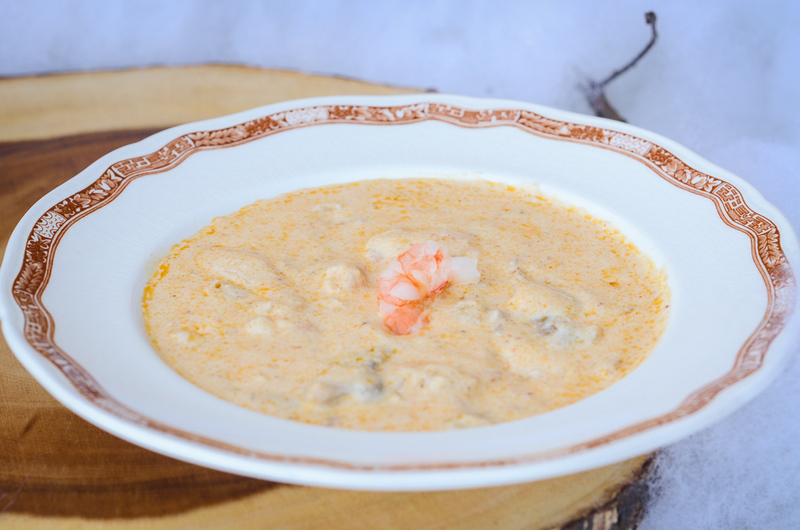 This seafood bisque was dreamed up by one of my younger employees, Robert Gordon, at the Café and served every Friday. With tons of flavor, this decadent cream-based soup makes for a great weekend meal. Serve with crusty bread and you’re good to go! NOTE: I use fresh large shrimp, sautéed in butter and cut into bite-size chunks. You can also use small popcorn-size shrimp, adding 6 to 8 to a cup of soup or 12 to 14 to a bowl. *Shrimp base and lobster base are available at specialty food stores. If you do not have a local specialty food store, check online at Amazon.com or an online specialty food store. Although it may require more work to find these ingredients, both add so much flavor to this soup and will give you enough to make this many times! Melt ¼ cup of butter in a medium saucepan over medium heat. Sauté the onions and mushrooms in the butter until the onions are translucent. In a Dutch oven, melt the remaining ½ cup of butter. Add the flour and whisk until the flour has dissolved in the melted butter and a creamy, light brown paste (a roux) has formed. Cook the roux until it is dark tan in color. Add the shrimp base and lobster base and mix well. Stir in the milk slowly and let the mixture thicken until it looks like peanut butter. Add the heavy cream and the half & half to the onions and mushrooms and heat through. Slowly add the onion mixture to the roux mixture, then add the paprika. Let it come to a slow boil and then add the sugar. Reduce to low heat and cook until the soup thickens, about 35 to 40 minutes. Add shrimp to each serving as a garnish and a hearty addition.